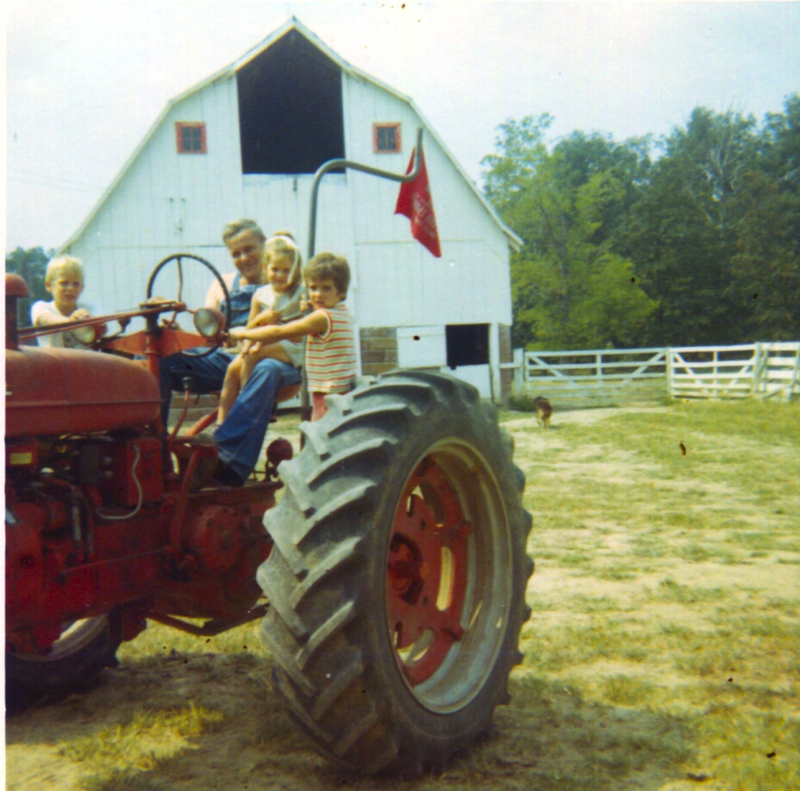 Every summer growing up, my family journeyed from Chicago suburbia to my grandparent’s farm in southern Illinois. They called us “city kids,” and we couldn’t wait to indulge in the expansive freedoms of country life. Grandpa’s antics left us in constant stitches while Grandma’s love-laced culinary prowess nourished both body and soul. We’d spring from the wood-paneled station wagon t0 a sporadic chorus of moos, oinks, and cackles, while honeysuckle, tomatoes heavy on the vine, and sweet corn tickled our noses. I’d affix myself to Grandma’s elbow, an eager sponge mirroring my mentor’s every move. From sunup to sundown she labored, transforming each morsel of food consumed with tireless hands. Woven into the daily demands were simple pleasures, like piling onto the front porch swing at the end of the long day. Grandparents first, followed by a layer of grandchildren, and topped off with the latest litter of purring kittens. The swing’s chains creaked in time with chirping male crickets claiming their conquests. An occasional freight train rumbled down nearby tracks as we kids marveled at stars not visible back home. Sometimes, a puff of cool air bored through the wall of humidity, teasing us with anticipation of a brewing storm. When bolts of electricity splintered the horizon in flashy zigzags, we’d count out the seconds until thunderous vibrations rattled the windows of the tiny farmhouse. Scooching closer together, Grandpa would captivate us with another tale — some more far-fetched than others — but any eyebrows raised in Grandma’s direction only elicited a collaborative grin. They did eventually own a television, but I never recall watching it. Even as children, we were astute enough to know what we’d be missing out on in the real world. All these years later, the wisdom seeded in the heartland of my youth seems more relevant than ever: Log off, power down, and cherish life’s golden moments because summertime slips away in a blink, and once the harvest arrives — We Can Never Go Back. You know, I never lived on a farm, but here in New Jersey (which was farmland before my time) when things were less built up in the 1970s, I loved going to the fields as a little girl, collecting bugs in my “bug catcher.” And, wow, it’s been YEARS since I’ve seen a grasshopper or a praying mantis. I miss those simple days. And I miss my Grandmother. Thanks for a beautiful five-star post! Awww, thanks sweet lady! As the third of twelve grandchildren (my mom was the oldest of five), I was blessed beyond measure to have as much time with my grandparents as I did…And still, I miss them every day — and they’ve been gone nearly twenty years! Aww, big hug to you! My Grandma died in 1995, so I can relate. I cried after reading your post, remembering her. But we are so blessed to have had such wonderful experiences. Some people never even get to meet their grandparents. You have both a great memory and a talent for wording that memory. Any chance you could email me a copy of that photo? …this is beautiful. Reminds me of similar days growing up in Calgary, Alberta, Canada, when we would visit Grandma and Granddads farm. It’s true…we can never go back. I haven’t thought about those days for a long time. Thank you. So true! I remember being at my dad’s parents farm and never watching tv or spending a minute indoors. Brought back a lot of happy childhood memories. That reminds me of visiting my great grandpa’s farm and of my grandmother. Thanks! Thank YOU! I may be a bit partial ;), but I can think of no better place to grow up than the good old midwest. My other grandparents lived in town, and we still had a ball — any memories made with grandparents are a blessing! this is so beautiful. thank you for sharing some of your memories. made me feel nostalgic for old summer days with my parents. long nights, cookouts, chasing lightening bugs, watching the bats dip down from the night sky, hearing crickets chirp, a warm breeze, and the glow of the lights inside. oh, the things that we learn as we grow. savor every moment. Beautifully written, LL! Made me think of my own relationship with my grandparents. We would often leave Sweden and head for Norway when we were little to visit them. It was in their company that I fell in love with nature, especially the mountains and wandering in them. Lucky YOU!! 😀 Thanks for dropping by Lovely Lady! “They did eventually own a television, but I never recall watching it.” Indeed. TV please, there is too much REAL entertainment to be had outdoors! Amen to that!! I wonder sometimes how different the world might be without TV? A perpetual dreamer I shall always be…Thanks for visiting!! Your continuous warmth of reception on this journey inspires me ways I cannot properly convey in words… Huge hugs of gratitude and friendship coming your way!! Thanks for a beautiful post! It brought me back to my childhood days – very similar experiences with my grandparents on their farm in Northern Europe. You are so right in reminding us to cherish the golden moments as they are presented to us. Thank YOU! I’m pleasantly surprised by how many enjoyed similar childhoods in all different parts of the world. Sadly, with all the technological “advancements,” I fear gadget overload is gobbling up precious memory-making opportunities today. It breaks my heart to see a family out for dinner, intently pecking at their phones instead of conversing…Hopefully, they’ll figure it out before it’s too late! I ‘liked’ this because it reminded me of precious memories of my own childhood, growing up with a loving family and wonderful grandparents, especially my maternal grandmother, who filled my childhood with love and genourosity. I spent long school holidays with them , in what seemed like paradise; waking up in a huge feather mattress bed, sunshine streaming through the window, fields and walks by the river with my granddad. All long since passed many years ago. Thank you for reminding me how lucky I was/am. Thank you for dropping by and following my blog. It’s much appreciated and good luck with the writing. I love your photos and wit, looking forward to more! Thank you. I often reflect how tough life must be for the many people who grew up without the foundation of a loving family behind them. It’s not really surprising if people go wrong when they never had a model of what is right to guide them. (I’m not excusing bad behaviour just understanding why). It has made me more tolerant and patient of others and I hope, like you, I am able to share some of that good fortune somehow. “the wisdom seeded in the heartland of my youth seems more relevant than ever” You write beautifully! A wonderful picture you painted here and such a powerful and important message. Thank you for this post! I felt it!! I felt it!! Wow pretty girl.. you make cyber waves! I know that you are not new to blogging and have quite a few followers, but I nominated your site for a Liebster Award. I have more information on my blog. The picture reminded me of a summer that I lived on a farm with my aunt and uncle. Great memories! I am humbled by your graciousness, Dear Teacher. Thank you!! I love this story, and the pictures you paint with your words. You are a fine storyteller! I hope you will share more of your memories. Pingback: 4:14 am. And Inspired. – Lead.Learn.Live. Hi luggaelady. Sounds a fantastic foundation for anybody’s life. I feel envious I didn’t have such a family. May I thank you for your very encouraging and great comment and liking my poem ‘ Narrow Lane’. There’s more to come. Take Care. The Foureyed Poet. All these years later, the wisdom seeded in the heartland of my youth seems more relevant than ever: Epic statement! I was counting those seconds between thunder and lightning today! …. my Grandpa’s tractor….and to keep trouble at bay my grandmother taught me to sew..crochet, quilt..busy hands LOLs…. today as i wander through my gardens…and/or quilt I smile knowing I am only here because they loved me enough to let me be me letting my being different grow with no restrictions, just acceptance….it didn’t matter that I was an Army brat…. Thank you for sharing you….. Seeing your name here warmed the cockles of my heart, Dear Bill! I so appreciate your visit and your kindness. Give your beautiful wife a hug from me. Hope to see you both in October! I almost wished I was there! Love it!! !